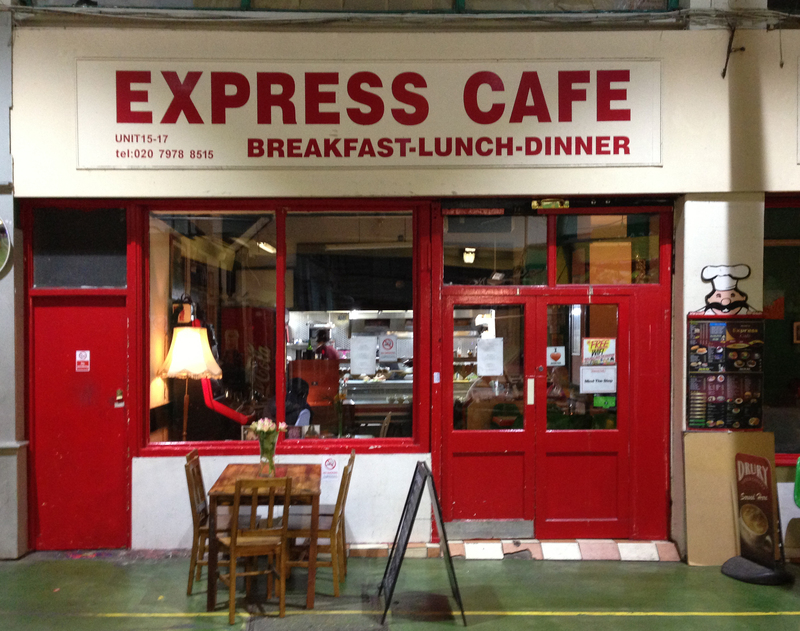 You have passed by the Express Cafe in Market Row during the day and you may even have popped in for a bacon sandwich, a mug of Nescafe or one of the cheapest espressos in Brixton. But each evening from Thursday to Saturday and Sunday (9.00 – 4.00pm) this basic cafe metamorphoses into a French Vegetarian restaurant “L’Express”. The interior is from another era with 1950s cream decor and a bit of half timbering. The tables and chairs from the formica 1960s and, rather startlingly, there is a ceiling fan reminiscent of a Magritte painting as it is stuck up against a wall so cannot turn – presumably a leftover from an early renovation. Lighting is muted with table and standard lamps, flowers adorn each formica top and the pictures are eclectic. An old gramophone and a fruit machine provide further colour although we were not sure either worked. The music when we visited was rock and roll but it depends, we thought, on who brought the CDs or whether their live musician turns up. The French/Caribbean menu is blessedly short with three starters, three mains and two puddings and they are puddings as this is a very hearty menu. The Red soup comes with bread, yams and dumplings, there isn’t one but two different types of feillete on the plate with vegetables and salad and they are just two of the starters. So come with a healthy appetite or stick to one course. 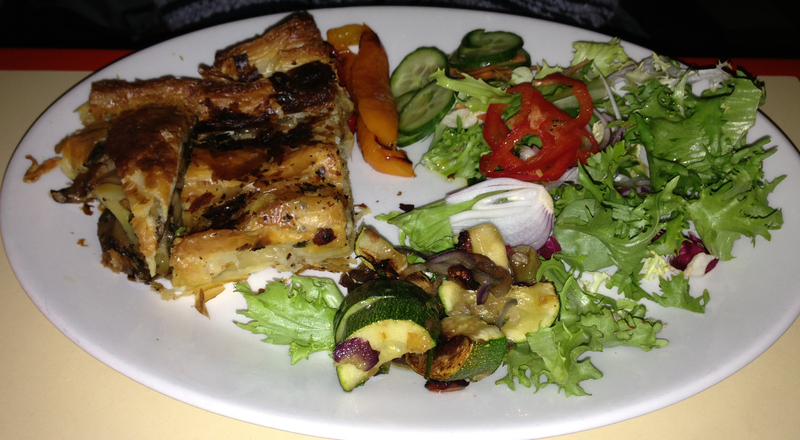 The goat cheese and honey feuillete is warm and really interesting and (not described on the menu) was accompanied with a roast vegetable feuillete (also delicious) but maybe one piece might be enough with the roast vegetables (mostly courgette) and salad. The red soup was peppery hot and the yams, pumpkin and dumplings were filling – again just the yams would have been fine. The third option we saw being shared by other guests and was a set of tapas with tapenade, green olives, almonds and a basket of sour dough slices. For main courses we chose the spicy yellow masala and the traditional french aubergine gratin (so this is definitely not all vegan). The gratin came with crunchy potatoes, ratatouille and salad and the plate was emptied. Roast vegetables were supposed to come too but didn’t and that was somewhat of a relief. The spicy yellow masala curry was just that. It came in a separate pot to pour over the rice, roasted vegetables and salad. 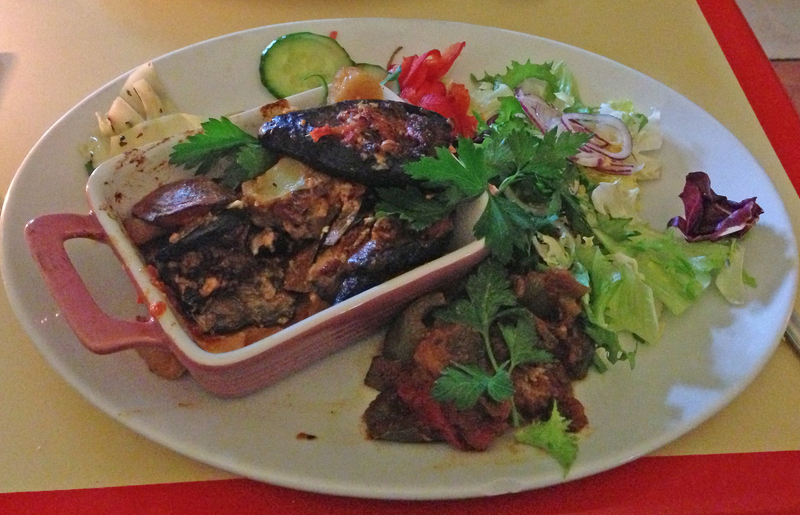 It was also advertised with “surprises” which was a hearty spicy aubergine. We were surprised by another aspect of the meal as the yellow peas were still quite crunchy and may (for our taste) have been better cooked for a little longer – like an hour longer. 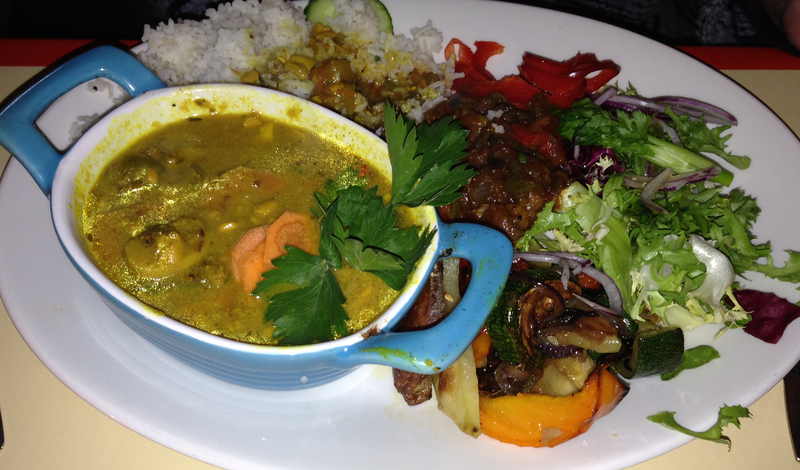 We didn’t have the Black Bean Caribbean cassoulet with rice, plantain, fruits, roasted vegetables and salad but we fear that if we had we would never have left the restaurant. We also declined the chocolate cake and the apple crumble. We were full to breaking point – but in a good way. Drinks are water or bring your own alcohol but as it is in Market Row there is a very good wine shop only feet away and another one on Coldharbour Lane. We stuck to water but the wine would have whiled away the time. Service was relaxed – and all the better for that. But when there is pressure on tables it might be better for their turnover to be swifter. The total bill was £26.50 and well worth it. The menu seems to change weekly, and judging by their facebook page sometimes daily, so we will be returning and bringing friends. We also felt very superior walking past the long lines for Wishbone and Bukowski as we had been able to sit down straight away and speak (not yell) to have a conversation. We think this may change as the word gets out. Hi there, have you reviewed Le Delicorner on the corner of Upper Tulse Hill Rd and Brading Rd? I think it’s very good, French cafe with baked goods and freshly cooked lunches.